20786 Serjeant John Joseph Richardson DCM, 6th Battalion, the Machine Gun Corps died of wounds 7 July 1918 and is buried at Nine Elms British Cemetery, Poperinge, Belgium. He was 28 years old and is commemorated on Evenwood War Memorial. By 1918 Sarah had died and John Joseph (senior) lived at 3 Gordon Gill, Ramshaw. 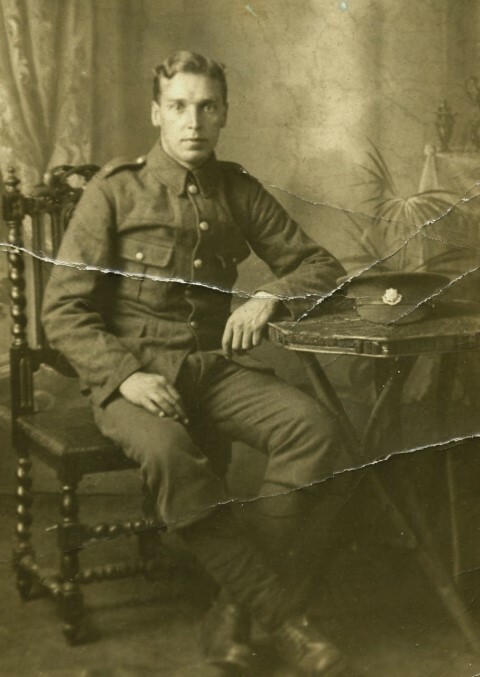 John Joseph Richardson enlisted at Barnard Castle and served with the East Yorkshire Regiment being allocated the regimental number 14018. The service record of Serjeant J.J. Richardson has not been researched and the date he joined the Machine Gun Corps is unknown. His regimental number was 20786. Machine Gun Companies and Battalions – some details. In November 1914, a machine gun training school opened in France and in England – at Belton Park and Harrowby Camps, Grantham, Lincolnshire. Until the winter of 1917-18 British machine guns were deployed in companies with a company attached to each infantry brigade but from about the beginning of March 1918 machine guns were re-organised into battalions, one to each infantry division. Prior to January 1918, the machine gun companies were attached to infantry brigades (or squadrons attached to cavalry brigades) and were armed with 16 Vickers guns (cavalry MG Squadrons 12 guns). They took the brigade number i.e. 19 MG Company of the 19th Brigade. There were 288 Infantry MG Companies (Coys.) and 26 Cavalry MG Squadrons. A Major became the Brigade MGO, a Captain commanded the Company of 16 guns. A MG Company consisted of an HQ, 4 Sections of 4 guns and a Transport Section. Sections were divided into 2 sub-sections each commanded by a subaltern, the senior being the Section Commander. Sub-sections each had a Section Sergeant and a Section Corporal. Transport Sections of mule drawn limbers for guns/ammunition were larger than an infantry battalion’s transport. Cavalry MG Squadrons had 6 no. 2 gun sections. Regimental Sgt. Major – Regimental Police, discipline, ammo supply, POW, regimental tradition. An infantry battalion had 4 companies, divided into 4 platoons each commanded by a subaltern. Platoons were divided into 4 Sections each under a Corporal. There were 2 sub-sections and 2 gun teams consisting of 6 men to each team. A Gun Team had a crew of 6 men and they had specific tasks. No. 1 a Lance Corporal was in charge, fired the gun and carried the tripod. No. 2 fed the 250 round belts into the gun and carried the gun. No. 3 supplied ammo to the gun, another observed, there was a range finder. The Vickers MG Mark 1 was used by the Army from 1912 and earned a reputation for reliability and effectiveness and remained the support machine gun of the British Army until 1968. The gun is water cooled. It is capable of firing 10,000 rounds per hour then the barrel has to be changed – a trained team could do this in 2 minutes. Ammunition came in wooden boxes ready belted or in cardboard boxes of 100 rounds which then had to be hand fed into the canvas belts. A mechanical loading devise was available. From 1904 – 1914, the War Office ordered 10 guns per annum. By 1918, Vickers produced 39,473. Each weapon cost the tax-payer £80. The 6th Division did not take part in any major battle (defined as such) until The Advance in Flanders 18 August to 6 September 1918 but were involved around Ypres in several actions. Between 3 April and 24 August 1918 there were some 4,715 battle casualties in the Ypres sector which includes 750 at Neuve Eglise (71st Infantry Brigade) and 250 in the attack on Scottish and Ridge Woods. The Franco-Belgian border was still an unpleasant place to serve. 27 June 1918: the Division passed to the XIX Corps and relieved the 46th French Division (Chasseurs) in the Dickebusch sector. Casualties: 1 OR wounded2 July 18: Dickebush & Hallebast corner shelled intermittently during the morning & back areas received a lot of attention. Enemy transport heard distinctly on Vierstratt. 4 July 18: Half of D Coy moved to Reserve Camp. During the night of 4/5th a rearrangement of m.g. positions was carried out, these being now two coys in front & support line (A& B) one coy in support (A) & D Coy in reserve. 6 July 18: 33 Div. & 41 Div. took portion of our front on left & right flank respectively. Harassing fire continued. 7 July 18: Area N14 O0 50.60 to N15a 40.60 harassed by m.g. fire during the night. Enemy artillery active on H27a & e and H27 a 30.30. Rounds fired by m.g.s 8000. Enemy transport heard on road near N.5d. 7 July 1918: Serjeant John Joseph Richardson died of wounds. It is likely that he was one of the 6 Other Ranks recorded in the war diary as “wounded” during the first week of July 1918. For conspicuous gallantry and devotion to duty in action in charge of a machine gun. 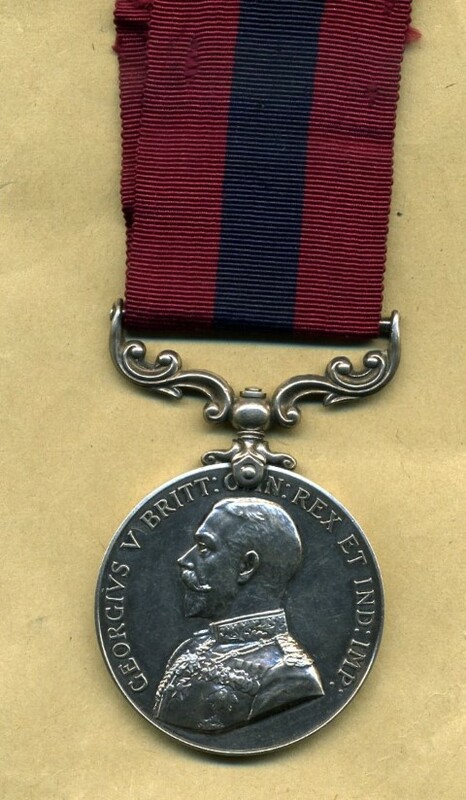 Serjeant J.J. Richardson was awarded the DCM, the British War and Victory medals. 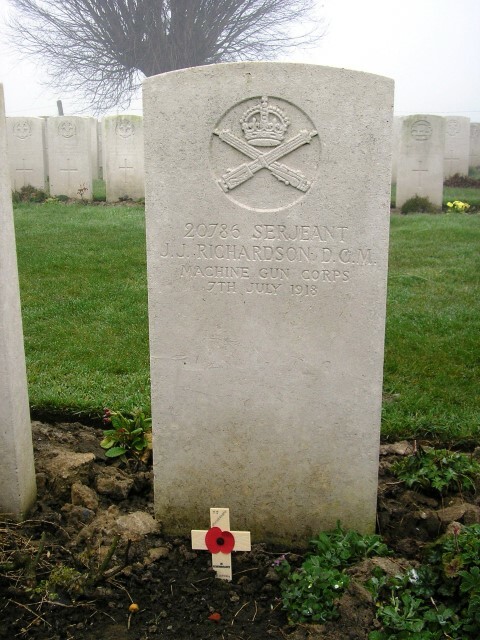 Serjeant J.J. Richardson is buried at grave reference XI.F.18 Nine Elms British Cemetery near Poperinge, West-Vlaanderen, Belgium. The cemetery was first used from September to December 1917 for burials from the 3rd Australian and 44th Casualty Clearing Stations, which had been moved to Poperinge in preparation for the 1917 Battle of Ypres. The cemetery was used again by fighting units between March and October 1918, the period of the German offensive in Flanders. The cemetery contains 1,556 Commonwealth burials of the First World War and 37 German war graves from the period. Serjeant J.J. Richardson is commemorated on the Evenwood War Memorial. SAUL HATH SLAIN HIS THOUSANDS BUT DAVID HIS TENS OF THOUSANDS.